Historical Background of the Book. After destroying the Northern Kingdom in 720 B.C., Assyria continued to be the dominant power in the region, reaching its zenith around 650 B.C. 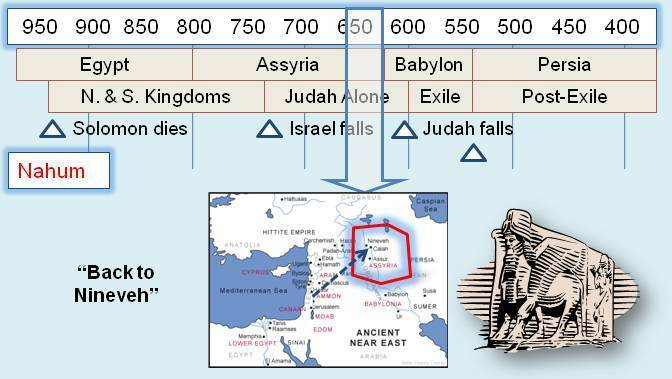 During this time, Judah repeatedly resisted the Assyrian invasions, most notably under Hezekiah (2 Kings 18). Although Assyria was the regional "super power" of the time, they were under periodic pressure and challenge by the Egyptians to the SW, the growing Babylonian Empire to the south, the rebellion of vassal states (including Judah), and (according to some scholars) some invading people from the north. It would only be about 40 years after their zenith before they would fall to the next regional "super power", the Babylonians, around 612 B.C.. The Author and the Audience. Around 650 B.C., God chose Nahum to take a message to Nineveh, the Assyrian capital city. Little is known about Nahum. Ch. 1 God hates evil and Nineveh would experience His wrath. Ch. 2 Nahum prophesies of impending siege and plundering (as fulfilled by the Babylonians in the not to distant future). Ch. 3 This would be as punishment for their sin and could not be averted. Messages for Christians. What can Christians learn from the book of Nahum? Unlike Nineveh, Christians can avert final punishment for their sins and be forgiven, although they may suffer lasting, negative consequences from their sins (e.g., social diseases, unwanted pregnancy, lost jobs, weakened influence).